The magician has again made it to the news, while I say that, it means it is no one but our favorite honeycomb shaped Graphene and the world’s biggest treasure for futuristic innovation + a permanent solution to other burning issues. Being specific, the wonder material has a greater affinity towards oxygen and hydrogen which in proportion gives birth to another useful substance, known as Graphene Oxide. Application wise, it could command the work order ranging from optical non-linearity to rechargeable battery. However, scientists from Washington University in St. Louis have optimized its characteristics according to its use in water purification – in an unimaginable scale. Dirty water to drinkable water rather projects an idea of a huge scale that is achievable depending on where the two extreme points are fixed. This time, Indian-origin scientists could extend the range much more than what is generally expected. As written earlier, this Graphene-oxide has immense application in a variety of fields. If interweaved in nano-cellulose foam the customized light-weight, strong and flexible material conducts heat and electricity in the quickest manner. Associate professor Srikanth Singamaneni, mechanical engineering, and materials science at the School of Engineering & Applied Science has implied that tropical countries or countries receiving ample sunlight could use the lab-created material as a filter to transform polluted water to drinkable water. The solution provided by the team has conglomerated different subsections of nanotechnology, biology, environmental science, material science, chemical engineering and ultimately produced a green solution that is simple, user-friendly and cost effective. The key product of their research is a bi-layered hybrid bio-foam consisting of bacterial nano-cellulose (BNC) layer coupled with a reduced graphene oxide (RGO)-stuffed BNC layer. While giving a directive detail, researchers said that the nano-scaled cellulose fiber network has a distinct property that channelizes the water to the evaporative surface while confining the heat in the air/water interface. In short, steam generation is achieved where the structure used, has a light-absorbing graphene oxide coated nano celluloses at the top and pristine nano-cellulose at the bottom. When the complete structure is submerged into water, the water pierces through the layers stacked below to hit the top position where evaporation takes place. According to the team, the light is projected on the top level and photothermal (light-to-heat) conversion takes place due to the properties of graphene oxide. Now following the basic physics, the heat dissipation occurs and it spreads over the bulk water present below the target layer. To restrict the flow, the pristine layer is stitched with the bottom position which helps to localize the heat in its requisite place. 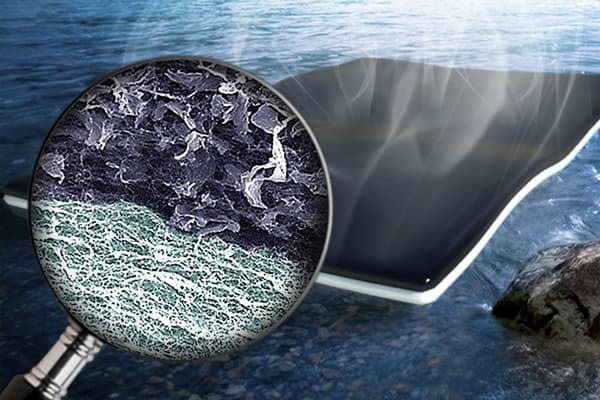 The lowest layer offers a sponge-like behavior which pushes the water up to the graphene where evaporation takes place. After the water is purified it is collected from the top of the surface. The nano-cellulose foam is carved from bacteria and graphene oxide flakes are incorporated in it. A graduate student and the lead author of the respective paper, Qisheng Jiang explained that the graphene oxide is mixed with the medium while the cellulose is getting ready in the incubation. The previous graphene oxide medium is removed and another new sample of the same compound is reintroduced in a fresh medium. Pratim Biswas, a professor from the Department of Energy, Environmental and Chemical Engineering commented that the foam material used to engineer the structure has properties that can harvest solar energy. Plus the structure itself is drawn in such a way that other nanostructured compound could work as a catalyst for purifying the water. The team would like to further investigate the total procedure and experiment with other materials that will help to kill pollutants and other contaminants. The complete research article has been published in journal “Advanced Materials”.